If you need to straighten your teeth with orthodontics, the Center Point Dental team is at your service! Here in Payson, we are proud to provide patients with advanced orthodontic options. You can choose between traditional braces and Invisalign clear aligners, depending on your smile needs and your personal preferences. Whatever treatment you choose, we are going to give you the flawless smile you want! Contact our office to schedule your orthodontic consultation, where we can talk more about your potential treatment. Traditional metal braces have been around for so long because they work on any smile! Even the most complex smiles can achieve their ideal alignment with traditional braces. If you are interested in boosting your smile with braces, schedule an exam at Center Point Dental today. Attach metal brackets to the surfaces of the teeth. Weave the wire through each bracket. Place pressure on the wire, which is transferred to the brackets and teeth. Our skilled dentists will place the proper amount of pressure on the teeth to gently shift them into their new alignment. 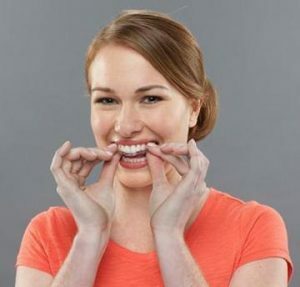 The Invisalign system is the newest orthodontic technology! If you are looking for a more sophisticated, subtle, or convenient approach to braces, Invisalign might be right for you. Rather than using brackets and wires, Invisalign uses clear plastic alignment trays. Each set of aligners are designed to shift the teeth towards their ideal positions. After about two weeks, you will switch your aligners out to wear the next set in your custom Invisalign series. No one has to know you’re wearing braces! Could braces improve your health and aesthetic? Which form of orthodontics is right for you? Doctors Diquattro and Flaherty will analyze your smile and help you decide what your needs are. To schedule your consultation, contact Center Point Dental today.